On Friday morning I once again loaded myself, my bike, and a bag full of assorted not throughly thought through belongings into the Maine Winter Sports Center van… to start yet another trek south (always south, always down…down back into the lower 47). Destination? Deerfield, Mass. Earlier this summer my coach got this idea into his head from his fellow cycling fanatic friends to do is rumored to be one of the hardest century rides in the east. The D2R2 or rather the Deerfield Dirt Road Randonnee. I opted to do the half and even more foolishly opted to do it on my road bike. I should have known better when the slogan for the event was “Celebrating 300 years of carriage roads!” or even more obvious use of “dirt road” in the title of the event… but once I had arrived in Deerfield there was no turning back. They had camping right at the start and finish area and when I arrived the girls already had our tents set up and waiting. 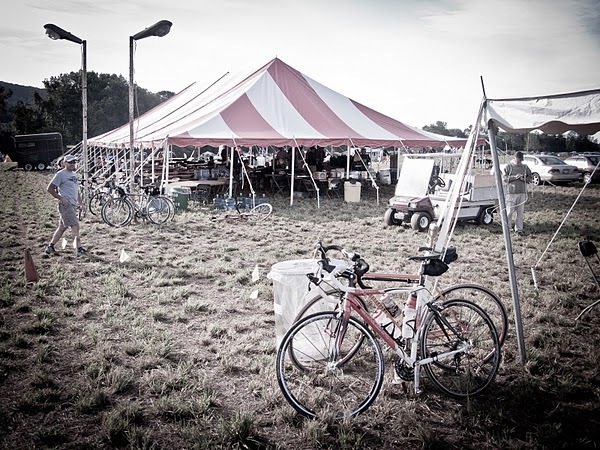 After sleeping undisturbed I woke up to the hustle and bustle of the 180km riders getting ready to depart around 6:30. Wrinkled, damp, and clad in my sweatpants and fleece socks I finally stumbled out of our tent and over to the event tent to get some food and much needed coffee. I soon had a plate full of hard boiled eggs and coffee cake in front of me. With a hot cup of coffee in hand, I was a happy camper. At 9 oclock, a handful of m&ms in hand, we made our way to the start area to sign out and begin our day on in the saddle. Looking around we soon realized we would be the odd men out on road bikes, all around us bikers stood over cyclocross and even mountain bikes and I began to wonder what I had signed myself up for. I spent the next several miles paranoid I would flat, that I would be one of the dozens of cyclists stranded on the side of a little dirt road fighting with a stubborn spare tube. However, the miles went by and I surprised myself by keeping my bike upright. Before the first water station I was adopted by a group of riders from the coast area who after teasing me for my bike choice took me under their wings. They guided me through the rougher dirt sections and I would take turns at the front helping pull through the uphills. There was one pretty scary descent where the dirt was washed out and riddled with rocks begging to buck me off and pinch my tires but when I got to the bottom and back onto more solid ground I found one of the guys of the group had actually stopped to wait for me to help me ride back to the group! It was a day of perfect weather, amazing volunteers, and 600 very happy racers who were each treated to a pint of beer upon crossing the finish. After finishing up the designated trek I decided I hadn’t had enough and after thanking my new friends for a wonderful day on my bike I headed back out on the rode to ride for another hour. At the end of the day I had meandered around 77 miles of mostly dirt rodes, climbed 8000 feet, and spent a solid (and incredibly happy) 6+ hours in the saddle. Just another wonderful day at the office! here are some pictures I have borrowed from one of the mean of the Minuteman Road Club, I spent too much time gripping my handle bars and not enough time reaching for my camera in my jersey pocket.